Felix Mendelssohn (1809–1847) was a child of privilege, but his contribution to classical music is undeniable. His father was a banker; his grandfather (Moses Mendelssohn) was a philosopher. After his parents discovered Felix’s immense natural abilities, they helped Felix begin developing his great potential. Like Mozart, he started composing early, but Mendelssohn’s childhood music is even more mature-sounding — especially the Octet for Strings (written at age 16) and the Overture to Shakespeare’s play A Midsummer Night’s Dream (written at age 17). Felix Mendelssohn, the man who rediscovered Bach. About 17 years later, Mendelssohn composed some background music for the same Shakespeare play. Among those new snippets is the single most famous piece Mendelssohn ever wrote: the wedding march that gets played right after “You may now kiss the bride.” That little piece has become so familiar, so much a part of popular culture, that it often surprises people to hear that it was actually composed by somebody! Like Mozart, Mendelssohn simply wrote down music from his head, fully formed, without any need for a first draft. Fellow musicians would carry on long, pleasant conversations with Felix, marveling as he notated music on paper in mid-conversation. Mendelssohn was one of those rare composers who achieved fame and fortune without having to die first. His Piano Concerto no. 1 in G minor, for example, was such a hit that, for a while, it was the most-performed piano concerto ever written. In fact, the composer Hector Berlioz went around telling the story of a piano at the Paris Conservatory. This particular piano, the story goes, was so used to playing that Mendelssohn concerto that it continued playing the music even if nobody was touching its keys! The local piano-maker tried everything to make the piano shut up: sprinkling holy water on it, throwing the piano out the window, chopping up the keys with an ax; still the piano wouldn’t stop. Finally, he got serious: He threw the remaining pieces of the piano on a roaring fire — and the concerto was silent at last. 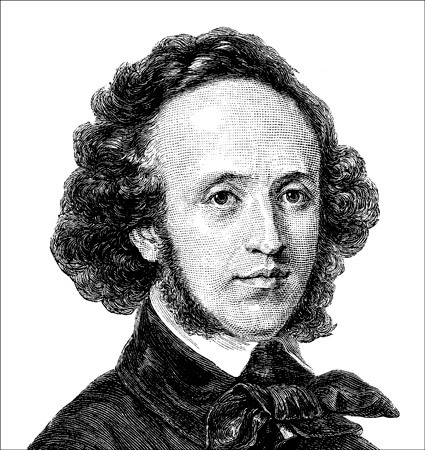 Though of Jewish descent, Mendelssohn was baptized as a Lutheran, and he composed many pieces on religious subjects. As an adult, Mendelssohn conducted the orchestra in Leipzig, Germany, where Bach had written his sublime masterpieces a century earlier. In fact, Mendelssohn played a major role in popularizing Bach’s music. As you may remember, Bach was famous as an organist, not as a composer; many of his compositions languished in storage (or were thrown away) after his death. Felix Mendelssohn unearthed and performed Bach’s monumental St. Matthew Passion for the first time since Bach’s death. From that point on, Bach became revered, admired, and beloved the world over. Mendelssohn sought to continue the tradition of Bach and Handel in his own oratorios, such as Elijah and Hymn of Praise. But Mendelssohn’s symphonies are even more famous than his oratorios; the Fourth Symphony, called the Italian, is especially great. In it, Mendelssohn captures the breezy, festive atmosphere that he experienced on vacation in the Italian countryside. You can almost taste those little frozen fruit-ice things that the vendors sell. When the time came to conduct the first performance of St. Matthew Passion, Felix Mendelssohn walked up to the conductor’s podium and opened the huge book of sheet music on the music stand. Only one little problem: As the audience members were settling into their seats, Felix discovered that he had the wrong music score! The book looked the same as the actual Bach piece — same thickness, same leather binding — but it was a completely different piece by a different composer. No matter. Mendelssohn lifted his baton and began to conduct Bach’s piece, turning the pages of his impostor score every so often so as not to alarm the musicians. He managed to conduct Bach’s entire Passion (which is more than two hours long) from memory, with no noticeable mistakes. He must have listened to it a lot on his MP3 player. And here’s that neat octet he wrote when he was just 16: Octet for Strings in E-flat major, opus 24.